I’ve got a confession to make (that any orange and blue-blooded Florida Gator should definitely not admit to.) My favorite part of a football game is the tailgating party before the game ever starts! 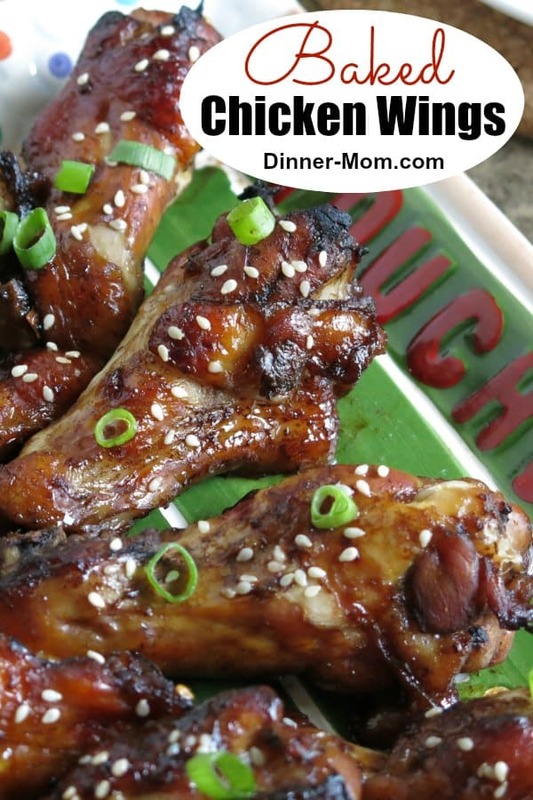 My go-to recipe is Mahogany Baked Chicken Wings and Drumettes…’cuz you’ve got to have tasty wings! 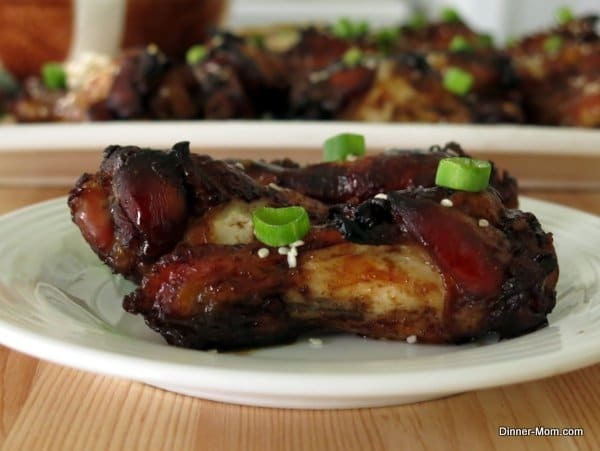 These baked chicken wings owe their mahogany name to the dark, sweet glaze they are baked in. It’s a combination of balsamic vinegar, honey, molasses, chili sauce, ground ginger, and garlic. It was inspired by the Mahogany Chicken Wings on AllRecipes. Instead of soy sauce (we’ve got an allergy in the house,) we used balsamic vinegar, which perfectly complements the other sweet ingredients. These wings are sticky and addictive. 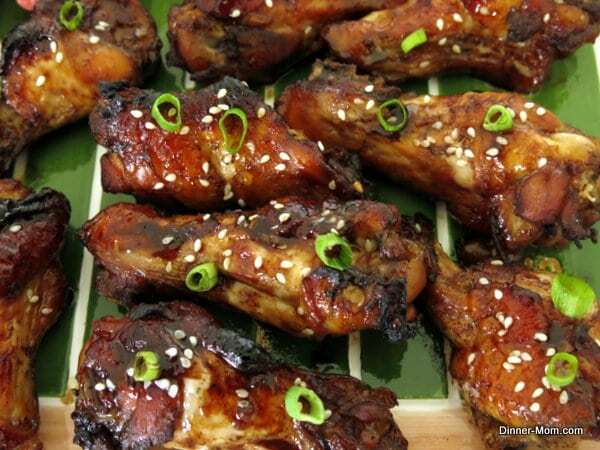 Garnish the baked chicken wings and drumettes with sesame seeds and green onion for a festive look. Baked chicken wings in a sweet mahogany glaze are a party hit. Balsamic vinegar, molasses, chili sauce plus a few more ingredients make the secret sauce. Add all of the ingredients, except for the chicken to a large plastic bag that seals. Combine ingredients by massaging the bag contents or use a spoon stir. Add chicken to the bag and turn bag until the chicken is coated with marinade. Marinate chicken in the refrigerator for at least one hour and up to two hours, turning the bag over half way through. Bake chicken in the oven for 50 minutes or until the juices run clear. Discard the marinade or bring it to a full boil for 3 minutes on the stove top and serve as a dipping sauce with the chicken. Foodies can be more excited for the food than the football, I give you permission 🙂 These wings look so yummy. Thanks for hosting the party! I’m enjoying reading all the post and getting very, very hungry! Love that you baked your wings! I also love your football plate! Looks amazing!! Thanks Heather! They didn’t last long! These look absolutely incredible! I love the sauce you have on these baked wings. I’m going to try it with chicken tenders. Yum!! Thanks Alida! We’ve had them in skinless drumettes too…but, I didn’t get any pictures! It’s so nice to see another Gator Fan Around the Family Table! You can bring these over for any of the Gator football games! Who could focus on the game when those are on the table? Thanks! There seem to be quite a few in the #SundaySupper group! Perhaps we’ll have to meet up at a game! Ohh this sounds so good! Love the flavors going on here. I agree, my favorite part of the Swamp is tailgating for hours before the big game. Go Gators (I am not talking about yesterday)! Love that these wings are baked…a gal’s gotta save calories where she can! These look like something my hub would love on gameday…no matter the sport! wow those wings look great! My mom actually enjoys different style wings for her dinner, so I’m going to make her these next time I visit! The glaze on these wings looks and sounds great! All the ingredients sound like a perfect match! Your glaze is amazing! The molasses is genius. Love how dark these chicken wings are. They look coated in deep flavor and oh so yummy. Great recipe! These wings look finger-licking good!! These baked wings sound simply divine. Yum!!! So nice to have met you Marjory at the F & W Conference in Florida. And so great to see this post. I’m sorry for the soy allergies but balsamic vinegar sure does sound like a scrumptious substitute…P.s. Your photo skills are stellar! Thank you! It was a pleasure meeting you as well! 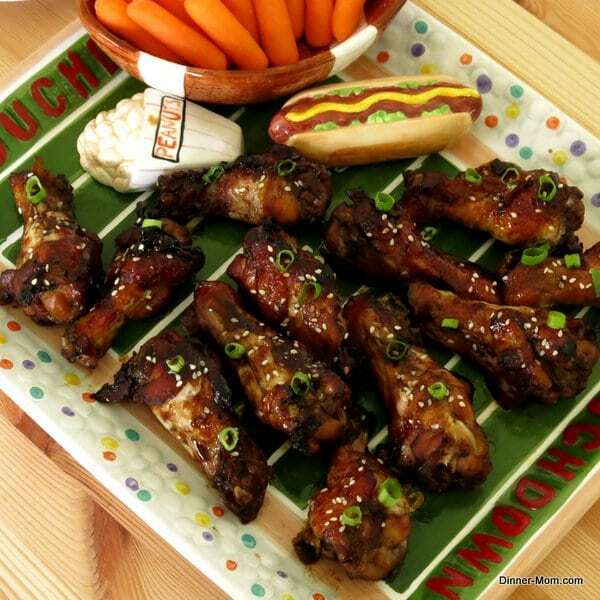 Forget tailgating, I’d eat these wings anytime. Love everything you put in the marinade and glaze. 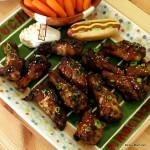 Huge fan of balsamic vinegar, so these wings are perfect for me! Sweet and spicy aare my kind of wings! Not usually a fan of wings, but these look amazing! Thanks for all the nice comments. It was such a fun tailgating event! That platter is adorable? Is that little hot dog and peanut bag built right into it? How cute. And the wings! Once I started making balsamic wings, they became my favorite forever. I just love their sticky sweetness. Your wings sound delicious, Marjory! Seriously it is like you knew I have been craving wings and posted these to push me over the edge! I am dribbling looking at these photos. I’m with you on the favorite part being the tailgating. You will find me parked by the food instead of watching the game. Thanks for joining in Sunday Supper this week and I hope to see you a part of more events to come! The SundaySupper bloggers are such a nice group. I’m planning my next recipe as I write this!